The newly introduced SRFIT & EPHES-C (Engineering Philosophy & Ethics in Society Research Center) series of conferences intend to be a place to debate and share common concerns of researchers from different sciences, engineering, philosophy and humanities, when trying to capture the high sense for the human being in the knowledge society. Our times could be described as the Engineers and Entrepreneurs Era. During the contemporary crisis, the search for meaning and spirituality in the very core of the complexity of the being are bringing together philosophy, engineering, complex studies and ethics in a privileged way: a way able to bring new insights to the search of possible answers to the question: Is there a spiritual turn in in the information era? 2. Is there a philosophy/ethics in the making? Due to the generous support offered by some local sponsors, the registration fees will be of 25 euros (covering the access to talks, seminaries and roundtables for three days and the book of abstract) and 25 euros for the special social program (1 day trip in the beautiful Bucovina). Due to the same generous local sponsors you will have free food! However, you will have to pay for your accommodation. If you not have an account on Easy Chair, please create it before submitting an abstract. 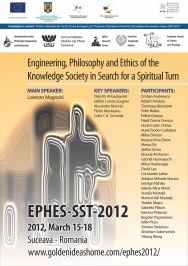 please feel free to send us your abstract at: ephes2012@yahoo.com. We will do our best for your good stay in Suceava!